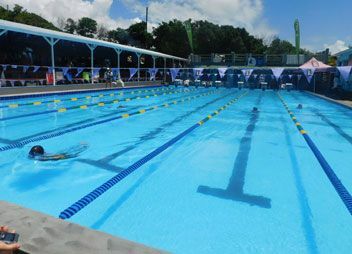 Now, SVG can host regional swimming meets, expose more Vincentian youth to the sport, and properly groom the next generation of talent. Kudos to the private sector partners for developing the facility, and to the Government for allowing the pool of the dilapidated Shewsbury House to become a springboard for sports and development. If you want to be a hotelier in SVG, youâre likely to set up shop in the Grenadines, where Bequia, Mustique, Canouan and Union Island host five-star facilities to match their five-star surroundings. Mainland St Vincent is a different story. Sure, there is the Buccament Bay Resort, but locally-owned hotels tend to carry the whiff of stale, threadbare memories of past glory. It is so refreshing then, to celebrate the 25th anniversary of the Beachcomberâs Hotel in Villa, which now boasts close to 50 newly-built or renovated rooms, a conference centre, a top-quality restaurant, and 40 well-trained employees. Beachcombers has grown by 42 rooms in 25 years, while still retaining its bed-and-breakfast charm. Hereâs hoping that they continue to grow and thrive. The surest sign that Roland âPatelâ Matthews and the NDP are getting worried about their hold on the North Leeward seat is the recent smearing of Carlos James as a “criminal,â and worse. As far as we can tell, James paid a $100 fine for cursing some bad words back when he was a teenager. Then, five or so years ago, Jamesâ ârecordâ was wiped clean, under a law that expunges fines and minor offences from otherwise well-behaved citizens. Patel may now be looking at the threat of a defamation case for his factual inaccuracies â can you be called a criminal if you donât have a criminal record? In any event, no one is going to think that a teenaged profanity disqualifies anyone from politics. If Patel wants to take on politicians who have committed “crimesâ yet offer themselves for office, he need not look as far as his opponentâs youthful indiscretions. There may be many a mote to remove from the eyes of candidates far closer to his political home. We love the election Silly Season: The colourful language, the picong, and the non-stop, personal campaigning are what make our Caribbean democracies vibrant and unique. There is no need to take offence at every loose comment or ill-conceived joke. However, there must be a limit. Wherever you draw the line on political common sense and good taste, weâre pretty sure that NDP candidate Noel Dickson crossed it with his vulgar and tacky attempt at wordplay when introducing his colleague St Clair Leacock at a recent rally. Dicksonâs whole “cockâ and “henâ commentary has been seized upon by the ULP, who are now playing it to great effect at their political events. The NDP, which has tried to brand itself as the party that is more concerned with womenâs empowerment and issues, should have apologized already. Itâs not too late. …Iâd ask the Minister for Housing how, exactly, does the Government distribute building materials to Vincentians. The process is so murky that no one knows the eligibility criteria, the waiting period, the amount of materials you can expect to receive, or even how to submit an application for assistance. Has this much money ever been distributed with this little oversight? We are no fans of shock jock Dwight âBingâ Joseph and his boorish radio personality. But give Jack his jacket: Bingâs OMG morning programme on BOOM Radio has muscled its way to the top as SVGâs most talked-about talk show. His Campaign Series, in particular, is now required listening for all political junkies, and his no-holds-barred style fits well with a rough-and-tumble election season.